On Nov. 11, 2015, Apple began taking online orders for its then-new iPad Pro. At the time, CEO Tim Cook said the 12.9-inch tablet would replace notebooks, as well as desktop PCs, for "many, many people," according to an article on The Telegraph.co.uk. Six months later, we decided to use the online Help a Reporter Out database to ask a number of business and IT executives for their thoughts on Apple's enterprise tablet, and if it had, in fact, replaced their laptops or desktops. The answer, based on 11 responses, was a resounding "no." However, the respondents also said the original, gigantic iPad Pro, along with the more recently released 9.7-inch model, complements their computers and smartphones. And a few of our sources use their tablets in creative and unexpected ways — as a dedicated, in-office Uber terminal, for example. Here's what the respondents had to say about the pros and cons of Apple's iPad Pro after using the tablet for six months. The iPad Pro tablet turns on quickly. It's light. And its iOS multitasking features are great. All of these things makes iPad Pro a terrific laptop alternative for quick, focused bursts of note-taking or other work, from wherever you may be, according to Ed Zitron, CEO of media relations agency EZPR. Zitron uses a MacBook Pro for most of his PR work, but it's heavy (current models start at 4.5 pounds), he says, and "pulling it out for four minutes of work, or even 30 minutes" is unfeasible at times. Zitron purchased the 128GB iPad Pro with LTE connectivity, so he can easily work in taxis or offices with weak or unavailable Wi-Fi. "There's a psychological feeling of 'out comes the iPad Pro,' and I know I'm going to take some notes … or if I'm on a plane, hammer out a document," Zitron says. "There's definitely more focus than the ongoing distraction of my laptop." Daniel Kosmala, director of marketing for Apple IT consulting firm Foojee, sold his 12-inch MacBook and used the proceeds to buy both the 12.9-inch iPad Pro and Apple's optional Smart Keyboard. (Kosmala says he even had some money left after the purchase.) "There's no lag time when waking up [the iPad Pro]," he says. "I just pop the Smart Keyboard open, and I'm ready to go." David Mytton, CEO of Server Density, a SaaS cloud-monitoring company, says he now uses his 9.7-inch iPad Pro for 90 percent of the work he used to do on a MacBook Pro, especially email and note taking. However, the "great thing is its versatility," he says. "I can use it anywhere and switch modes from work to leisure, such as watching videos and reading." Mytton originally considered the 12.9-inch iPad Pro but decided it was too big. "I may as well use a laptop," he says. "The 9.7-inch model is the perfect size for portability." Apple's optional Smart Keyboard lets Kosmala use his iPad Pro as he would a MacBook, but he can also fold the keyboard behind the tablet and use it to read ebooks. The iPad Pro and Smart Keyboard combo is still "light and easy to hold, even with one hand, and it's just as easy, if not easier, to store than a MacBook," Kosmala says. 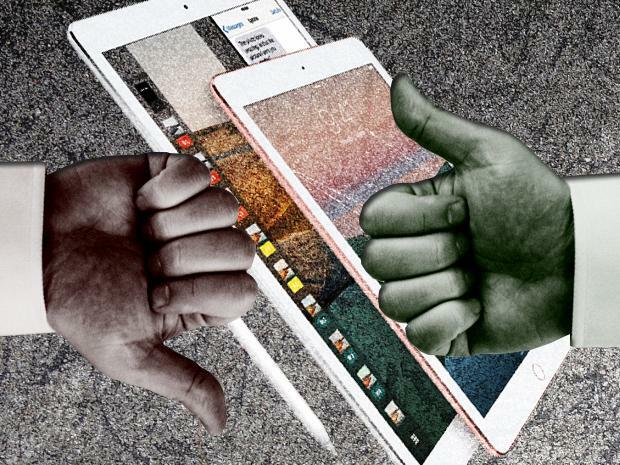 James Goodnow, one of the "techiest lawyers in America," according to the American Bar Association Journal, says all tablet displays are not created equal. The larger 12.9-inch iPad Pro's Retina display "shows you text and videos crisply and beautifully," he says. While the both 9.7-inch iPad Pro and the larger model offer similar Retina displays, the larger screen is "the clear winner," according to Goodnow. "There simply is no substitute for real estate," he says. "Whether it's fitting more information on the screen or watching movies on what amounts to a personal and portable cinema, it's nice to have a massive screen." Thanks to Apple's A9X 64-bit processor and 4GB of RAM, the iPad Pro "is lightning fast," according to Goodnow, and the speed of the tablet is "a huge improvement" over the earlier iPad Air 2. "When you're toggling between programs or trying to open a large program, [the iPad Air 2] is slow, and this iPad Pro solves that." Goodnow is a big fan of iOS 9's Split View mode, which works on iPad Air 2 and newer Apple tablets. "How many times have you been in a meeting and you're using your email and need to flip over to the Web, or you need to see your notes, and you have to hit the Home button to do it?" he says. With Split View mode, "all you need to do is slide your finger over to the right to bring over different apps. You scroll through on the right and pick the app you want." Goodnow also appreciates Slide Over, another iOS 9 multitasking feature, and calls it an "incredible feature that was long overdue." Peter McKay, senior vice president and general manager of sales in the Americas for VMware's end-user-computing business unit, says the iPad Pro hasn't replaced his laptop, but it is a valuable companion device that complements his smartphone in certain situations. For example, McKay uses the iPad Pro's (optional) Pencil stylus for taking notes, because the combo makes it easy to jot notes down and retrieve them later. "I take all my notes on my [9.7-inch] iPad Pro using the Notes app," says entrepreneur Jason Swenk. "I love how easy and visual it is, and that my notes are automatically shared among all devices." "Whenever a client comes to our office and they have no transportation, we will order them Uber service," says Jesse Harrison, founder and CEO of Zeus Legal Funding. Before the company purchased a 9.7-inch iPad Pro, clients "would use their own phones to order Uber, creating an accounting mess," Harrison says. "Ordering was also sometimes delayed because everyone in the office was using their phone for some other purpose and couldn't order Uber at that moment." The solution: set up an iPad Pro as an "Uber station," according to Harrison. "Now whenever anyone at our office needs to order Uber, they can just do it using the company iPad and Uber account." Harrison appreciates the lack of reflection on the 9.7-inch iPad Pro screen, as well. And Zeus employees also occasionally use the iPad Pro for company presentations, he says.